Meanwhile, in large bowl, combine ground turkey, parsley, onion salt, pepper and 2 tablespoons of the salad dressing; mix well. Shape mixture into 4 patties, 1/2 inch thick. When grill is heated, place patties on bottom grill surface. Close grill; cook 8 to 10 minutes or until patties are no longer pink in center. In small bowl, combine lettuce, cheese and remaining salad dressing; toss to mix. Spoon mixture evenly onto bottom halves of buns. Top with patties, tomato slices and top halves of buns. 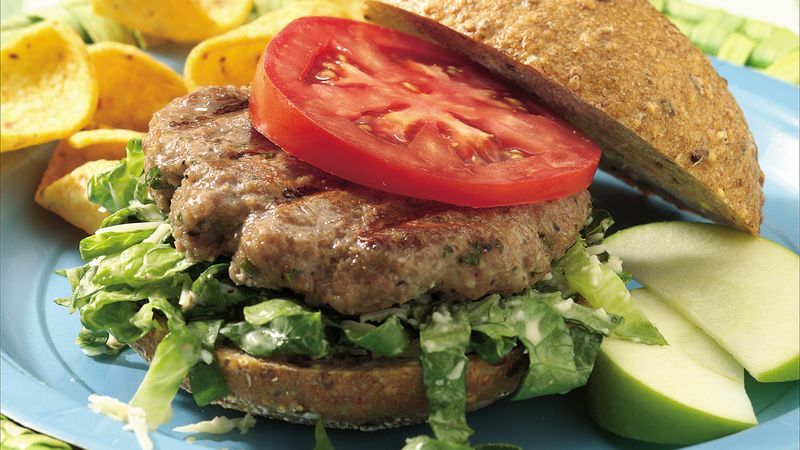 Make sure your burgers are lean by purchasing ground turkey breast. Products labeled simply "ground turkey" may also contain dark meat and skin, adding to the fat content of your burgers. Your contact grill cooks at high temperatures and gets very hot; use caution when working near the unit. We recommend using pot holders or mitts when opening or closing the cover. Also, be sure to cook the grill slightly before cleaning.